The Lord recently sent a little messenger to our Headquarters facility in the form of a butterfly, a beautiful Swallowtail. At first he appeared to be lifeless lying on the floor. But when picked up, he moved. He was ALIVE! He was immediately taken to the office of our receptionist, who then placed him in a nearby plant, while she researched how to feed him. Sugar water it was, so she set about to care for him throughout the week. When the weekend approached, she knew she had to take him home to keep him warm, fed and safe. After further research, she then prepared a terrarium with plants, sticks and rocks, to create a habitat that was familiar to him. 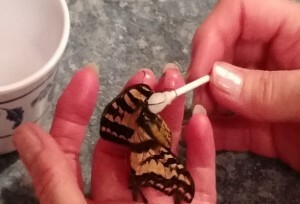 Using a Q-tip soaked in sugar water, she would gently hold him on her finger as he wrapped his proboscis around the tip (that is the long piece that extends like a drinking straw when the butterfly feeds), making it appear that he was feeding on a flower. While feeding, he would rest his legs on her finger. Each night when she came through the door, the dog would bark, the parakeets would sing and chirp and the little butterfly would flutter his wings, as though welcoming her home. The Lord had clearly entrusted the care of this little fellow to a woman whose heart was filled with gentle compassion and a nurturing spirit. As the days passed, she became aware that this little guy needed a name, so she asked the Lord what that name should be. He told her it was “Max”. How fitting it was, because Max was yellow and black. Prophetically speaking, yellow means light of illumination. Research had shown her that his days on earth were numbered and he was approaching the time when he would die, but now that he was named, she knew that it was okay for him to go. Shortly thereafter, Max did indeed die. So what’s the moral of this story, you may ask. There is most always a spiritual truth associated with a physical reality, and clearly this is true in this case. First, Matt. 6:22 says, “the eye is the lamp of the body; so then if your eye is clear, your whole body will be full of light.” In the secular translation in almost all modern languages, “Max” means great or greatest. This little butterfly, seemingly so helpless, one could say the least, came to teach us a lesson. We should not fear seeming weak because God’s strength allows and empowers us to fulfill our destiny with grace, beauty and greatness. When they encounter the lovingkindness of Jesus Christ through the power of His Holy Spirit, it causes them to thirst for more of Him. Yet in their brokenness, though they are clinging to the hope of life and truth, they oftentimes need to “rest” their wearied souls on the “fingers” of those standing in faith, believing in the miracle working power of God in their lives. Gentle compassion and nurturing spirits are what they cling to, until they are strong enough to reach up and take hold of the Promise of the Father on their own. Our receptionist modeled for us the heart of a servant, being moved with compassion as was Jesus. Through His Holy Spirit, we are empowered to function in all areas of our lives with this level of kindness, gentleness, compassion and love. Our little friend, Mr. Max, though his life was short, was sent to teach us this one truth: “When you are faithful in the little, I know you will be faithful in the much.” Thank you, Mr. Max, it was a joy to meet you!